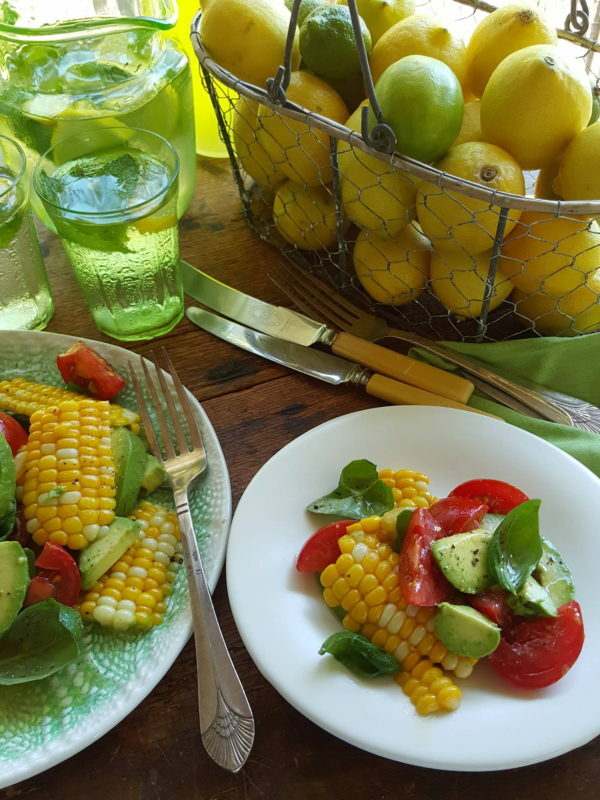 Summer Corn Salad, so fresh and vibrant, sings of summer! 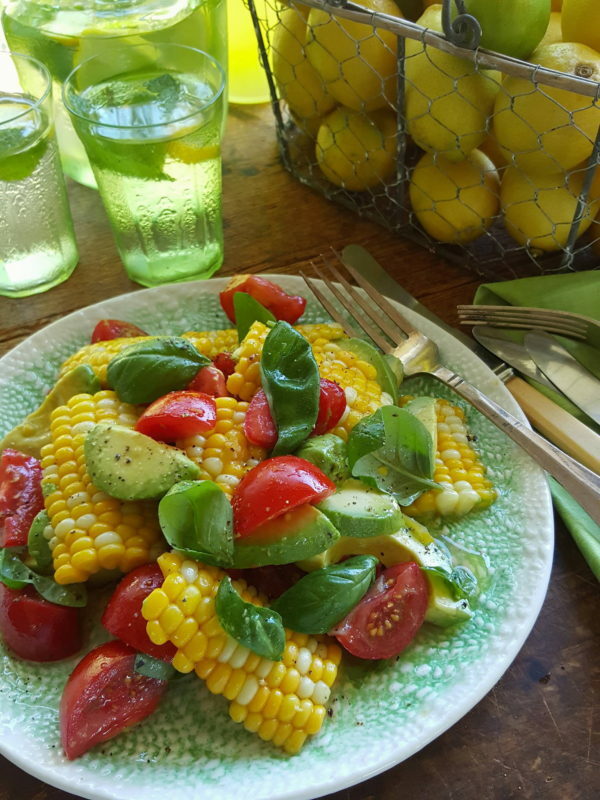 Fresh and vibrant, this salad captures summer produce at its peak. It would make a great addition to an all-vegetable meal, or serve it alongside barbecued or grilled chicken or fish. 1 Remove husk and silks from corn cobs. Cook in boiling water for 7-10 minutes, depending on maturity. Drain, drape with paper towels and leave until cool. 2 Cut tomatoes into quarters removing cores. Cut into wedges. Drain cut tomatoes in a sieve for 10 minutes. 3 Rinse preserved lemon under running water, dislodge flesh and discard. Dry the rind with paper towels and slice finely. Whisk vinegar, salt and pepper together and whisk in oil. Add preserved lemon. 4 Put tomatoes in a bowl and toss briefly with dressing, just to coat them with the dressing. Halve avocado, remove stones and peel. Slice or chop and add to bowl with tomatoes. Toss once or twice. 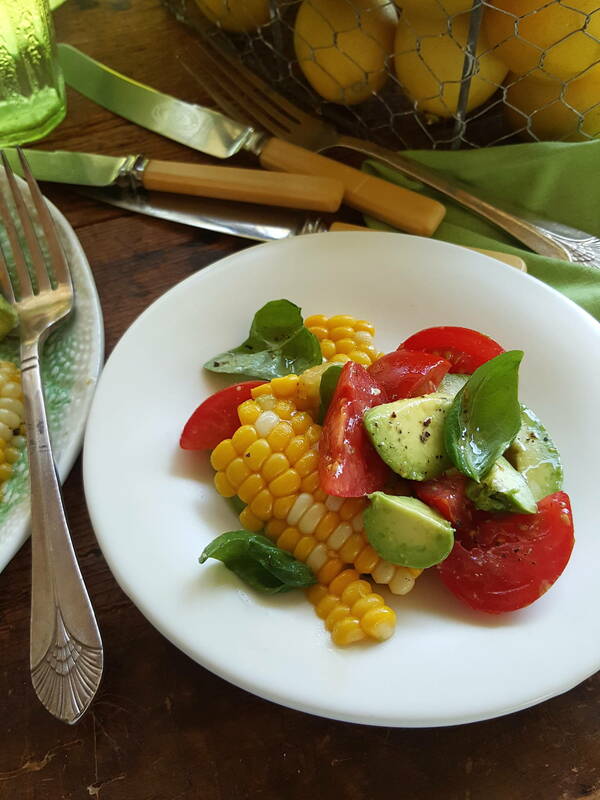 Slice corn kernels off cobs with a sharp knife. Add to salad bowl with basil. Toss once, then serve immediately.